We’re now on the third iteration of Intel’s Ultrabook strategy, and with Haswell’s launch now behind us we’ll be seeing a lot of new laptops and Ultrabooks with the new CPUs. After some early missteps, we’re hopeful that this will be the proverbially charming third time. Acer and ASUS have shown off some of their offerings, and now it’s time to look at what Sony is up to. Sony has always had a penchant for ultraportables (you know, what they were called before they became Ultrabooks), and laptops like the VAIO Z series have impressed with the amount of hardware crammed into a small chassis. With Intel’s new focus on improving integrated graphics performance, the days of requiring a discrete GPU for “fast enough” graphics performance may finally be drawing to a close, which gives companies like Sony the ability to create even smaller designs. That brings us to today’s launch of the VAIO Pro 11 and 13, along with the next generation VAIO Duo 13 Slider. Given their background in the home theater industry, you would expect Sony to know a thing or two about building high quality displays and speakers. Sadly, their storied history doesn’t always yield the best experience, and like other OEMs Sony has been involved in the race to the bottom that has played over the past five to ten years in the laptop space. 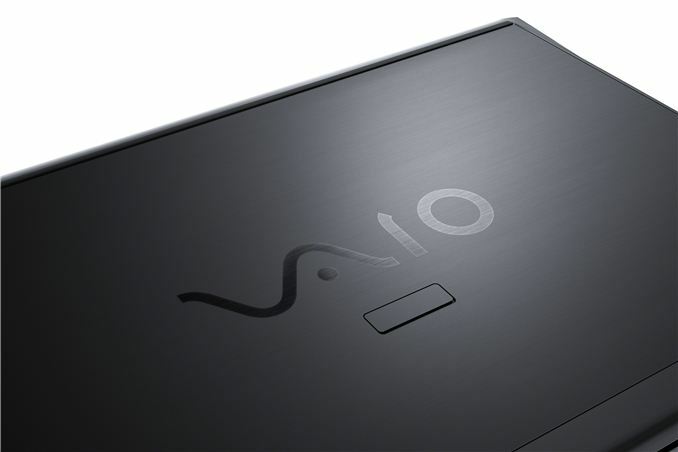 Thankfully, the VAIO Pro line looks to buck that trend and Sony’s press release makes note of the Full HD 1080p panels with TRILUMINOS displays that create rich colors and offer a wider color range. There’s no specific discussion of what panel technology is being used—we’ve seen both TN and IPS 1080p panels from Sony in the past, but hopefully the marketing materials end up translating into an improved visual experience. In terms of specifications, Sony hasn’t given the full rundown of the VAIO Pro laptops, but what we do know is that they’ll tip the scales at a scant 1.92 lbs. and 2.34 lbs. 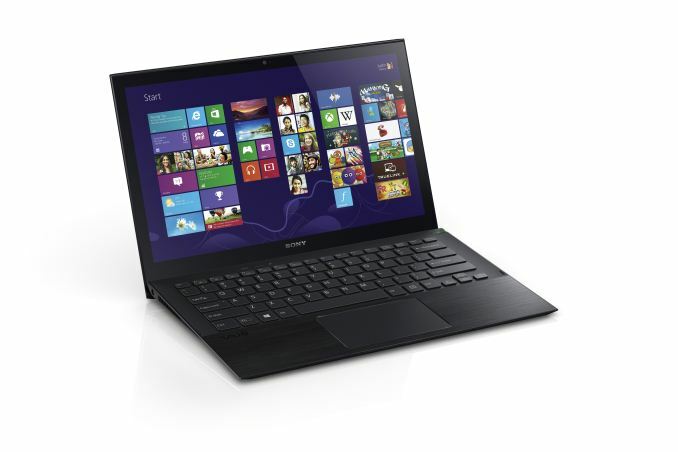 for the 11 and 13 inch models, respectively, making these two of the lightest laptops around. 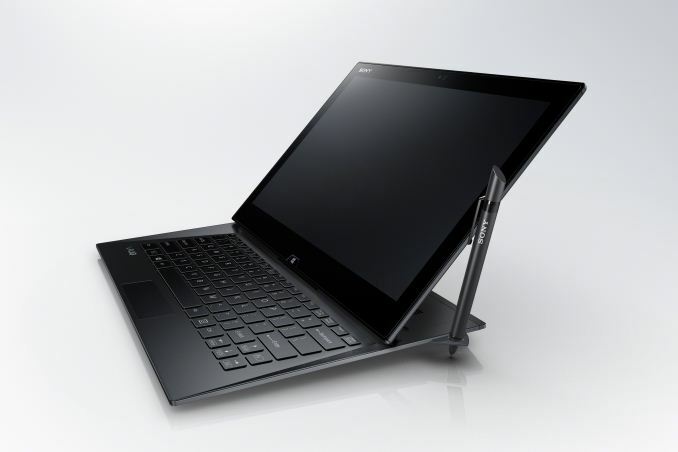 Like the VAIO Z series, Sony is using a carbon fiber casing on the VAIO Pro, with an aluminum palm rest. Sheet batteries are available for both models, boasting up to 14 hours of battery life on the Pro 11 and 13 hours on the Pro 13—double what the integrated batteries provide. The Pro 13 will also be the first notebook PC to include a PCIe SSD drive to potentially offer even more performance than standard SSDs, though as we know from our SSD reviews there’s more to a fast SSD than the interface speed. The Pro 13 also features a touchscreen, while it appears for now the Pro 11 will not. In a slightly different vein, the VAIO Duo 13 takes over for the previous generation VAIO Duo 11 as a hybrid Ultrabook/tablet. It also uses a carbon fiber shell and weighs 2.93 lbs. Despite the larger screen dimensions, Sony says they have minimized the bezel to maximize the viewing experience, and the Duo 13 is nearly the same size as the Duo 11. Also updated with the Duo 13 is the “Surf Slider” design, with a slimmer hinge and one-handed transitioning between tablet and laptop modes. Other features of the Duo 13 include the return of the active digitizer stylus that can be stored on the side of the PC. Capacitive touch interfaces are great for some things, but when it comes to writing and drawing an active digitizer and stylus are still the ones to beat. Sony also touts a new Exmor RS image sensor and an 8MP rear-facing camera on the Duo 13, which Sony claims is capable of functioning as an image scanner if necessary with their CamScanner application providing the ability to adjust for pictures taken at odd angles. All of the above Ultrabooks feature full-size backlit keyboards with full-pitch key travel, which is always good to hear but we’ll reserve judgment until we’ve personally typed on the laptops. Sony is also including NFC (Near Field Communication) technology in their new 2013 summer models, allowing for the quick sharing of website data and Bluetooth configuration between supported devices. SSDs are options on all of the above models, but we don’t have details on the capacities or price points yet, and CPUs up to Core i7 will also be supported. The laptops come standard with a one-year warranty with in-home service. Pricing of the laptops starts at around $1150 for the VAIO Pro 11 and $1250 for the Pro 13, and they should be available starting June 9 in Carbon Black or Carbon Silver. (Or if I read the press release wrong, it’s $1150 for Carbon Black and $1250 for Carbon Silver.) The VAIO Duo 13 will also be available starting June 9 in Carbon While or Carbon Black for around $1400. Well, Samsung Series 7 Chronos 780Z5E (the 2013 version with Ivy Bridge) comes as close as I've found. Excellent everything but especially the screen and battery life. With 8h actual battery life for light-medium loads I felt no need to wait for Haswell. When will Sony finally decide to put (mini) DisplayPorts connectors on their laptops!! !